Loaches are among the most intriguing and entertaining fish available for the tropical aquarium. Intelligent playful and highly sociable, they provide an entirely different fishkeeping experience. The first thing you'll notice about loaches is their unusual shape. Slender and eel-like, they are bottom dwelling fish, but they also enjoy climbing on rocks and plants and, if the right support is available, will sometimes climb part-way out of the water to bask. They also enjoy digging (so be careful you don't have any heavy rocks of ornaments which might get knocked over and injure them) and, if your aquarium has a soft substrate, will sometimes burrow. Their curiosity sometimes extends to trying to get out of the tank, so make sure you have a secure hood - these fish don't just jump, they sometimes try to open things! Loaches are happiest in groups of three or more, though they will also shoal with other bottom-dwelling fish if those fish are amenable to it. They are very tactile and use their well developed barbels to touch one another affectionately. Naturally, this is sometimes construed as an attack by other kinds of fish, which can lead to trouble, so they are best not kept with shy fish who are prone to stress or with aggressive fish who may start fights as a result. Generally peaceful by nature, it is very rare for them to start fights themselves. They like to have a complex environment with plenty of hiding places, but as they get used to your aquarium they will become less shy. Loaches are omnivorous and will eat most sorts of food, but they benefit from having a high quantity of vegetable matter in their diet. Cucumber and banana can provide good sources of vitamins. If they're not eating properly, they can almost always be tempted by live foods. They will attack and eat quite large snails in the aquarium. Clown Loaches -With their vivid orange and white markings, these delightful loaches look like elongated clown fish. They grow up to sixteen inches long and must be kept in groups of at least five, so you'll need to have plenty of space for them. Kuhli Loaches -Beautifully patterned in black and gold, these small, comparatively delicate fish should only be kept in mature aquariums. 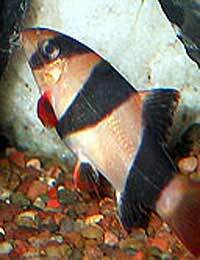 Dwarf Loaches -With their striking black and silver spotted pattern, these tiny fish are aquarium favourites. They are best kept in large shoals and require a soft substrate to burrow in. Yoyo Loaches -These exotically patterned black and silver fish are hardy and peaceful, though they sometimes fight each other for social dominance so you'll need to provide hiding places for the losers. They make an excellent choice for beginner aquarists. Zebra Loaches -These small stripy fish are happiest in large groups. They need a soft substrate and clean, well filtered water. Loaches are very difficult to breed in the home aquarium, and with many species this has not been managed at all, though you will sometimes see the females become gravid with eggs if they are kept in good condition. They form strong social bonds and sometimes engage in courtship dancing which involves spiralling around one another vertically in the water. The death or disappearance of a member of the group can cause significant stress to the others, so pay extra careful attention to them in this event. If you have to put one of your loaches in an isolation tank, it's a good idea to position this next to the main tank so that those remaining can still see it. Some loaches can live for up to twenty years, so taking them on is a big commitment, but they're always fun to be around and they'll really liven up your aquarium experience. I have what I presume is a loach in my aquarium. He is greyish in colour with a dark stripe at the back, and 'whiskers'.He has lived happily in a 'ship wreck' for a few years.Every time I introduce new fish, they mysteriously disappear or seem to have their fins eaten off.Yet he survives so it is not fin rot!He appears to 'chase' the other fish around the aquarium and one usually finds them hiding behind the filter. What monster have I got?!!! Hi, just one question can I put clown loaches in with my red tail shark? It's not wise to put Siamese fighters in with Angel fish as the Angels tend to nip at them. Just lost my loach,about 10+years old, gray in colour, have not seen any of this colour. can you help. I went to the pet store and I was going to buy a siamese fighting fish with a Zebra Loach and I had a angel fish they said that they won't go together but I looked online and they said that they would be fine. What one would be correct?